Are you considering a Corvette purchase but unsure about what the seller is telling you or perhaps you would like a second opinion? Let the experts at VetteWork help with a Pre-purchase Corvette Inspection. Is the seller representing that the car is matching numbers, and/or all original but you would like confirmation? Are you unclear what "matching numbers" means? Not sure about obfuscating terms and phrases such as tribute, clone, re-body, ready for judging, real deal, born with, body-off, restomod, all original, restoration motor, matching numbers, period correct, NOM, body-on, restamp, recreation, or CE block? If you see these terms, I recommend calling me BEFORE you contact the seller. Can you confidently recognize an original stamping? As an independent third party, the professionals at VetteWork can give you peace of mind. 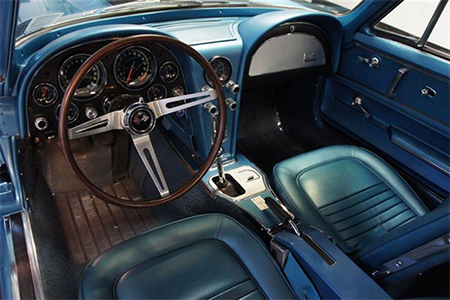 Before agreeing to purchase a vintage Corvette many clients take the prudent step of contacting and engaging VetteWork for a professional, unbiased, third party opinion. A Corvette pre-purchase inspection is designed to provide you, the buyer, with the information you need to be confident in your purchasing decision. After you contact Vettework, a Pre-Purchase Inspection Agreement is forwarded to you to execute. You contact the owner and receive permission to have the vehicle(s) inspected. You return the executed agreement along with a deposit, the details of the location of the vehicle(s), contact information of the owner. You then arrange a date for the inspection that is convenient for all parties. We inspect the chassis, interior, exterior and all mechancials. We road test the vehicle when possible and complete a thorough operations check to confirm all switches and controls function as they were originally designed, intended and expected. Modifications, replacement parts, collision repairs, defects, fluid leaks, rust or corrosion, etc., if detected, will be noted. After the Pre-Purchase Inspection, a comprehensive written report with photographs is forwarded to you. Corvette Pre-Purchase inspections are performed by us, in-person. We travel to the car from our corporate offices, unlike our competition who either contract with third party vendors who know very little about corvettes or inspect vehicles from pictures while sitting in a remote office. Armed with the knowledge contained in the Pre-Purchase Inspection, this benefits you in the negotiation process to purchase the vehicle by providing leverage with the seller. This also saves you the time and expense of traveling to the vehicle. Reports are confidential and not shared with the seller. My competition uses a business model whereby you dial an 800 number. They have third party contract agreements with local mechanics across the country who are trained to complete state safety inspections on all types of cars and trucks. These local mechanics are skilled at starting the car, completing a road test and making sure the radio works. What they are not skilled at is inspecting or appraising any particular car in detail such as a classic corvette to determine if the engine, transmission or any other part on the car is original to the car. • Is the frame or engine from another car? What impact would that have on the value of the car? • What does original paperwork look like? • What about the paint? Will it pass judging? What is the proper size of metallic that is acceptable? • Are they familiar with original character sets and original stamp pad surface finishes? • Do they have an extensive photographic library of original parts to use as a comparison? • Have they published articles on restorations in Corvette specific periodicals? • What level of recognized Corvette specific judging experience do they have? • How many cars have they personally restored that have gone on to achieve Bloomington Gold or Duntov status? • What specific experience or training do they have inspecting or evaluating the Corvette you want to purchase? My competition is not in the business of determining originality of any part on a Corvette (read the fine print) because they have no clue what they are looking at. Some of these guys can decode the numbers. Big deal. Anyone can do that. Can they tell you if the engine in the car today is the same engine that was in the car when it left the Saint Louis factory? Of course not. That plays a significant role in the value of the car. I have 20,000+ images of corvette stamp pads in my library collected from 20+ years of judging corvettes. These guys don’t even know what a stamp pad is, what an original looks like or where to find it. Some of my competition may initially be less expensive, but that small savings quickly evaporates when you realize you just paid $20,000+ too much for the wrong car that was inaccurately described by the seller using weasel language that is unclear. Then what are you going to do? Call your attorney? And spend more money? Good luck with that. You get what you pay for in life. Buyer beware.